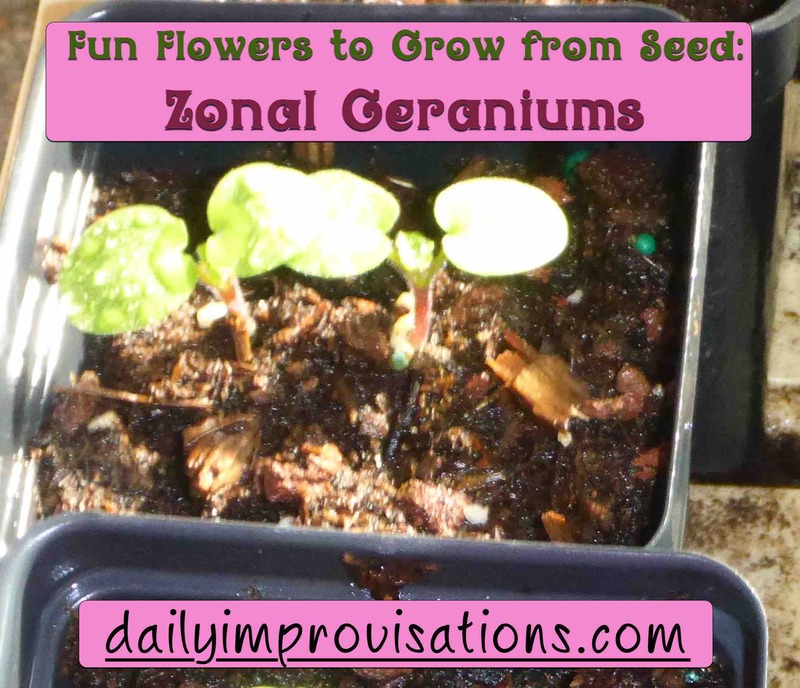 I had never seen seed for zonal geraniums until about 3 years ago. I had been told the plants were all grown from cuttings. This appears to be partially true. There has been a lot of breeding to get certain types of zonal geraniums and so far it has only been possible to predictably reproduce those by taking cuttings. However, there are seeds for many varieties of hybrid zonal geraniums available now. These zonal geranium seeds appear to have been coated with something, but not all of them were and they were still about this size. Actually, any geranium can be propagated from a cutting. Still, growing several varieties from seed was more cost effective. 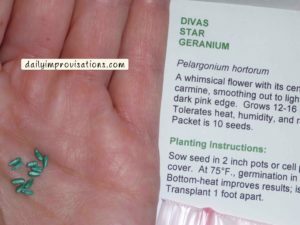 The seeds are somewhat expensive, as seeds go, but definitely less expensive than buying potted plants at the store. The seed can be purchased at reduced cost in bulk, but then I couldn’t afford as many varieties, even if I was getting a better price per seed. 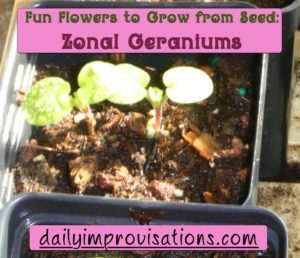 Just how easy is it to get zonal geranium seed to germinate? 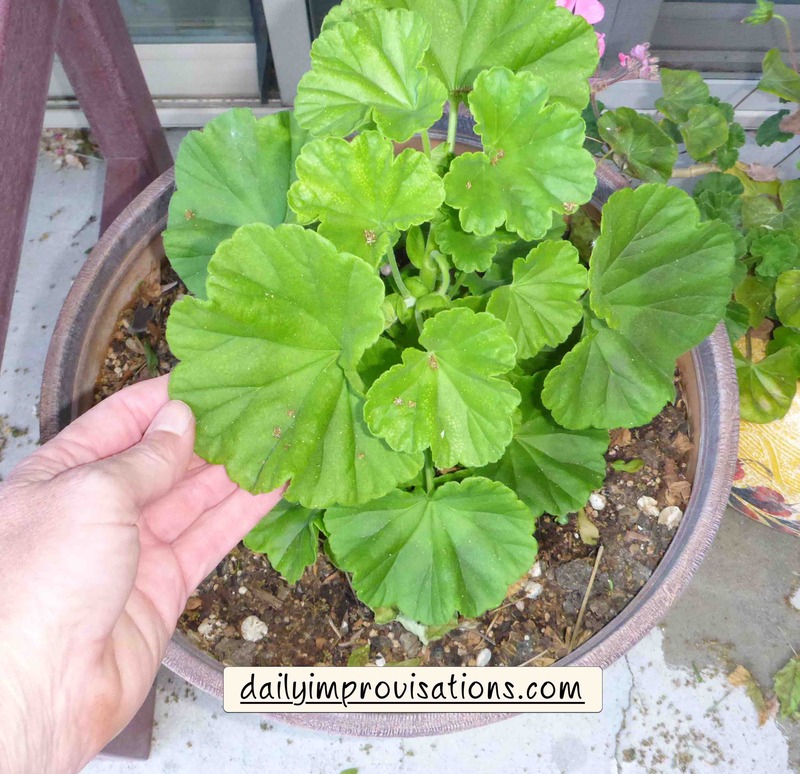 After so many years of only finding zonal geraniums available as potted plants, I was quite surprised at how easy they are to grow from seed. This is especially nice since there were only 10 seeds per packet. Happy day when nearly every one of them sprouts! I only had to follow my basic seed starting steps. The zonal geranium sprouts only looked like this very briefly. You may notice that it doesn’t say anything about moistening the soil or keeping it moist, but that is assumed for all seeds. 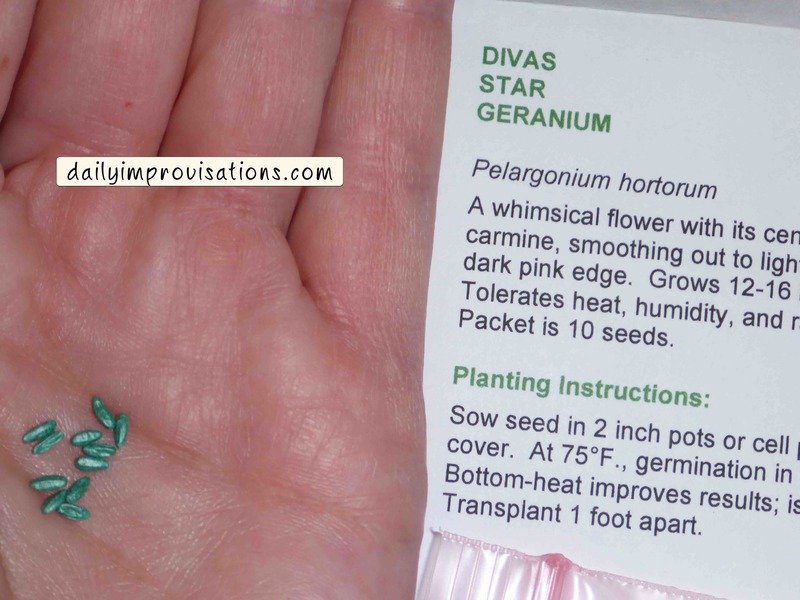 Some sources say the seeds need scarification, but I not done this for any of my geranium seeds. 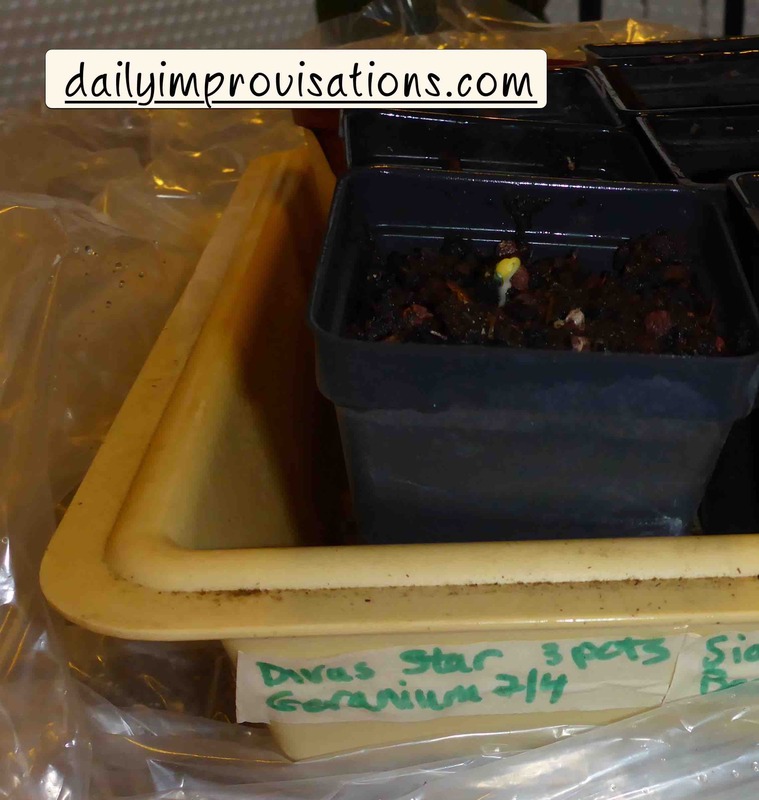 Not knowing they would germinate so well, I planted 2 seeds per pot. I was able to transplant the extra seedling in most cases, but next time I will just plant one seed per pot and deal with the occasional empty pot instead. You can see from my labels in the photos that I planted them in February last year. I didn’t record when they began blooming, but it seemed like I had blooms all summer long. Here is a side view of my zonal geranium sprouts. You can see their true leaves just beginning to grow at the top of the stem, between the two first leaves. The first photo show the same sprouts from the top. 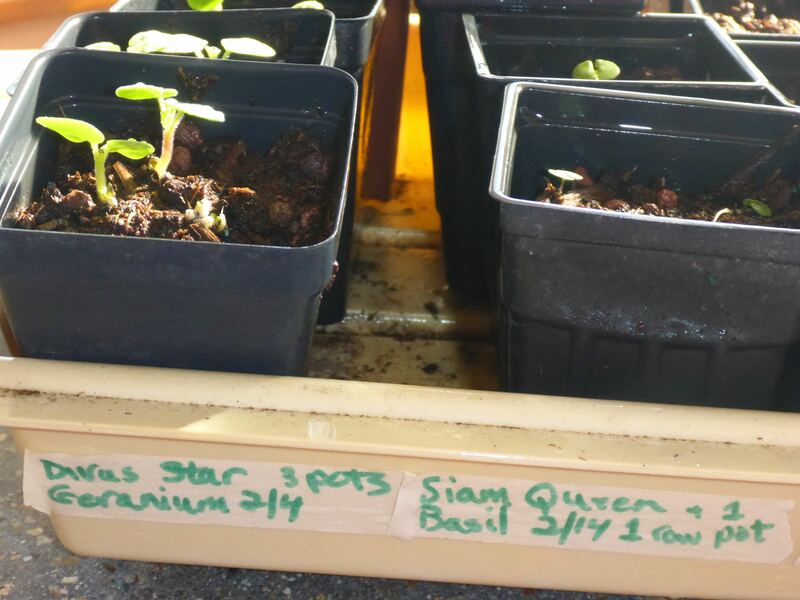 Not only did my seeds sprout ahead of the predicted timetable on the seed packet , but the seedlings came up thick stemmed and sturdy. None of this delicate flower syndrome for them. They quickly became upright, giving full advantage to their round, chubby first leaves. If they are common, no wonder! If all of my seedlings were as easy to care for as zonal geraniums, life in my greenhouse would be much less dramatic. If there is anything bad to say about zonal geraniums, it is that they get large rather quickly. 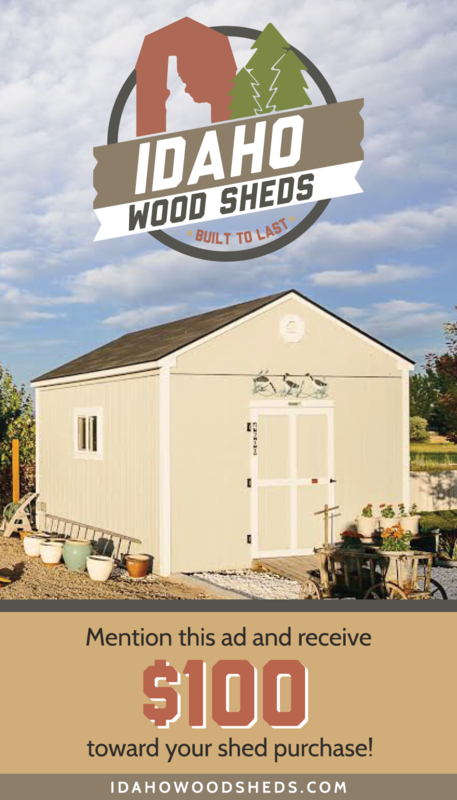 This means they need larger pots and more light space. Fortunately, they can also be hardened off as long as there as some daytime highs in the 50’s and 60’s. Being so sturdy, they can handle breezes and some precipitation more safely than other seedlings. 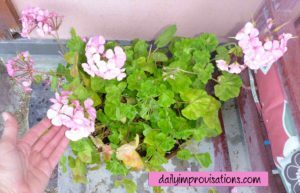 One of my zonal geranium planted in a large pot later that same spring. Since I started growing zonal geraniums from seed, I have also overwintered quite a few geraniums in my greenhouse. Some of these were my seedlings, while some were purchased plants. I have only done this with plants that were grown in pots all summer. I have read that some people dig up zonal geraniums and save the by hanging in a cool place. Most of the winter my greenhouse is on the cool side, staying around 55°F. This means that I don’t have to worry too much about watering. Still, I have not had any time during the winter when they haven’t been blooming! So far, every single plant this year has bloomed all winter long. If the white covering of snow was getting mundane, all I had to do was look into my greenhouse, which is attached to my kitchen. One of my grown from seed zonal geranium in bloom. I now have plans to fill some spaces in my landscaping with swathes of zonal geraniums, just because I can. Call it garish if you must, but I will call it wild, colorful fun!